Electronic Kit School. 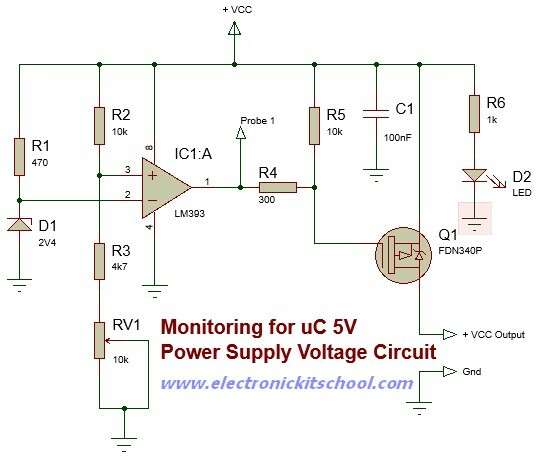 - Do you want to monitor your microcontroller power supply voltage with indicating when the voltage raising above pre-defined value before now? Yes, you can do it with implement the circuit designed in this article. In this article we will give you one electronic circuit that can give you microcontroller voltage power supply monitoring when the voltage raising above from pre-defined value of voltage before. This circuit design based on LM393 IC and FDN340P PMOS to do this work easily. This circuit of Voltage Monitoring for +5V Microcontroller Power Supply Circuit using LM393 and FDN340P PMOS shown like in Figure 1 below. Circuit like in Figure 1 above show you about the voltage monitoring for microcontroller power supply that can detect the raising voltage from the pre-defined value. This circuit based on two components are LM393 and FDN340P PMOS. Come from Electroschematic site that this circuit will work depending the description like that the output of this circuit can be interfaced directly to digital logic, turn off the connected microcontroller circuitry or reset the microcontroller before it goes grilled owing to an improper power supply voltage. The eternal single supply dual operational amplifier LM393 used to verify by the 'proof of concept'. However, feel free to try other possible alternatives like LM2903, LM193, etc. The LM393 consist of two independent voltage comparators that are designed to operate from a single supply over a wide range of voltages (2V-36V). The outputs can be connected to other open-collector outputs to achieve wired-AND relationships. The comparator compares two voltages, IN1 at the inverting (–) input and IN2 at the inverting (+) input. When IN2 < IN1, the comparator output is pulled Low, i.e. to GND, almost. When IN2 > IN1, the output is driven High, i.e. to nearly the positive rail voltage. The 2.4 V zener diode (ZD1) and the 470 Ω resistor (R1) form a shunt voltage regulator used to set up a reference voltage (IN1) of 2.4V at the inverting input. The 10K multi-turn preset potentiometer (P1) enables IN2 at the non inverting input to be set below the 2.4V threshold when the supply voltage (VCC) is at 5V. The output of the comparator LM393 (IC1) will then be driven Low, consequently the PMOS -FDN340P (T1) is turned on also. Now the input supply is extended to the rest of the circuit through the PMOS. However, when VCC exceeds 5V, IN2 goes above the level of IN1. This causes the comparator output to be driven to the positive supply voltage. This causes the PMOS to turned off. Today’s microcontroller-based projects may require both +5V and + 3.3V VCC lines. Fortunately, circuit explained above uses only one comparator from the LM393 package. Hence interested hobbyists can build an identical circuit for +3.3V VCC supply lines using the ‘free’ comparator. Since almost all components used in this circuit is available in ‘chip’ form, it is easy for an experienced hobbyist to make the whole circuit as a little plug ‘n’ play module with the help of inexpensive smd components. Like the comparator IC, part number of the PMOS is not very critical so there is a way to use suitable alternative p-channel mosfets in lieu of the type used here.